1. Check in is normally at 4PM and Check out is at 10AM. Our cleaning staff requires a 6 hour window. 2. Pets and smoking are prohibited because of both HOA rules and allergies on the part of some guests. 3. Damage deposits are returned within 10 days of departure. 4. Generally, a 50% deposit is taken within 3 days of rental and the remainder 60 days prior to check in. 5. Towels, linens, soap, paper products are provided. We suggest that you bring extra towels for the Hot Tub. 6. Garage doors must be closed at all times. Animals can get in the garbage and the pipes can freeze in the wintertime. 7. Hot tub covers must be left on the hot tubs at all times if not in use. 8. Maximum occupancy of the home is listed on the rental agreements. Parties, reunions may not exceed that number without the express written authorization of management. 9. Generally, parking in private homes is limited to two vehicles unless otherwise noted on the rental agreements. Condos have one parking space. 10. Higher end homes typically have water leak detectors. Directions for those are provided in the rental agreement. 11. Booking fees are NOT included if rented direct from Breck Heaven and you will save those dollars. If rented thru third party agencies such as Homeaway/VRBO/Trip Advisor, they will add 5 or 10% to your total. 12. Our owners require a minimum age of 25 for the primary renter. 13. We ask that you treat our properties like you would if staying in an Aunt, Uncles, or friends home. We understand if you break a glass and will not charge you. 14. A routine rental agreement specific to each home will be created for each individual home. It will list specific information on each home, check in/out dates and times and list all charges, totals and dates of final payment. We do take MC, Visa, AE, but add 3% as that is what our bank charges us. We routinely take personal checks via US mail. References can be provided if there is any discomfort with that. If you need immediate information on a home, please call Bill Handley at 813-685-7272. We are here to assist you in making your Breckenridge Vacation a Memorable One! Email us Today for detailed information and the BEST PRICING Available! We absolutely LOVE BRECK HEAVEN!!! The owner, Bill Handley, made it really easy to get prepared for our trip and have a great time. The house is fully stocked with everything we needed including bikes and sleds in the garage. We had multiple family members and it was so easy and convenient with everyone having their own bed and each bedroom having their own bathroom. It is truly a luxury paradise. One of my favorite parts is getting up in the morning and seeing the views of the mountains and occasional wildlife walking through the woods. We have been there twice, once in the summer and once in the winter, and our family always had lots of fun. The house is huge and a perfect set up for large families or groups. Some of the things we did in the winter were skiing (of course), cross country skiing, snowmobiling, snow tubing (has a magic carpet up the hill), sledding, indoor ice skating, and of course snow ball fights. In the summer we go hiking, biking (our 3 and 5 year old kids went for 4 hours with the little one in a weehoo and the 5 year on a half bike), boating, Glenwood Springs caverns (day trip) and hot springs, horse back riding, and white water rafting. 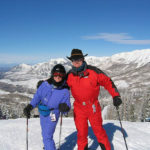 Bill and Kathy have made their properties a home away from home and are excited to be able to help others experience the incredible adventures and the amazing beauty of all that Breckenridge, Colorado has to offer. Whether you choose Highland Heaven, Alpine Paradise, Bear Haven, or Breck Splendor, Bill and Kathy know you will enjoy your stay in paradise.